First, let me start out saying that the Dominos Mediterranean Veggie Sandwich does not fall into the "healthy" category of sandwiches. But, it DOES fall into the delicious category. I have been trying to check out some of the vegetarian options in fast food. 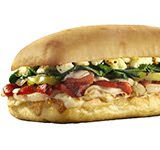 (See my Quizno's Three Cheese Deli Sub review here.) While Dominos already has veggie options in the pizza and pasta bowl areas, it's nice to see a veggie sandwich as well. The sanwich ingredients include roasted red peppers, banana peppers, diced tomatoes, spinach, onions, feta, provolone & American cheese, assembled on "artisan Italian bread". This sandwich is gooey goodness. The vegetables actually taste "vegetabley" and the feta and banana peppers give it a nice kick. The only thing I wasn't thrilled about was the oily bread. I did a little research and found out that the sandwich is brushed with "butter flavored oil". I further investigated and found out that this oil is a whole lotta chemicals crammed into a liquid mixture. Soooo...needless to say, I'll be ordering it without the oil next time. I am also hoping that will trim a bit off the 670 calories and 28 grams of fat contained in the sandwich. If you want to try to make it even more healthy, choose one or more of the cheeses to skip....but you will be missing out on the gooey goodness. According to one source, it also has 1990mg of sodium!!! 82% of your daily intake!!! I *used* to order that sandwich occasionally, but never ever again. I'll buy the peppers and make my own. When I am in a pinch and everyone is ordering pizza...this is my go to Dominos meal. I take off one of the cheeses and eat one half of the sandwich. The other half is wrapped and taken home for another meal for the next day. Any idea about the content of Egg in the bagel/bread? Is it really vegetarian? ? Usually only vegans would worry about eggs, but they also wouldn't eat the cheese either. My boyfriend is vegetarian and this is his go to when we order sandwiches from Domino's.